During my trip to San Francisco I made my way down to the touristy Fisherman’s Wharf area on Saturday morning. This part of the city was just waking up and the streets and sidewalks were still relatively uncrowded. They were setting up wine tasting tents on the street between Ghiradelli Square and Victorian Park. It looked like it was going to be fun but I needed to keep exploring. Although there are lots of tourist activities in this area you can still see authentic pieces of San Francisco and many of the places have been here for so many years that they preceded the tourist attractions – although finding these places can sometimes be a bit of a challenge. On Saturday, I came across a place that I do not remember seeing on past visits, Oakville Grocery. Their sign said they were established in 1881 – but they’ve only recently (I use that word loosely as it’s been several years since my last trip to San Fran) established this particular location. The store was filled with all kinds of gourmet goodies – sauces, vinegars, oils, crackers, salts, etc – and they have an extensive deli counter. There is also a wine bar with wines by the glass, but what caught my eye that morning was the giant paella pan simmering away near the front door. 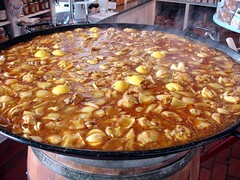 It was a huge pan of beautiful onions, chicken, and rice simmering in a saffron infused broth. It smelled good, looked good but it was still too early in the process (and in the day, for that matter) to dig into it! Dang it! I asked about the timing for the finished product and then continued my tour of the wharf area to bide my time until a plate of paella could be mine! A note to the reader: this is not a daily occurrence at Oakville Grocery but apparently it is something they do every Saturday morning. 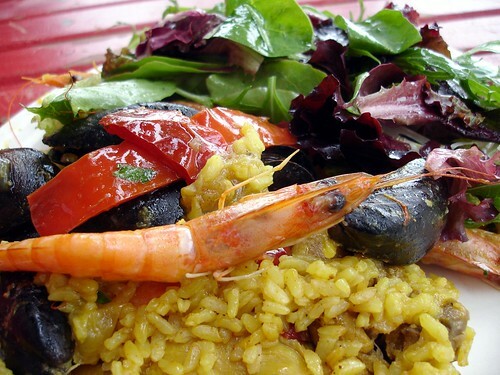 They start making the paella around 10:00 am and it is ready for purchase around 11:00 – 11:30. I returned at the appointed time but it was not yet quite ready, although all the seafood had been added to the pan. Now whole shrimp, mussels. red peppers, lemons and fresh parsley brightened the mix. While waiting for the final minutes to pass, I selected a few items from the shelves, purchased them and paid for my paella which was just starting to be served. For $10 I received a generous plate of paella and a lightly dressed green salad. I took my treasure to one of the sidewalk tables and prepared to feast. I sat at my table watching the sidewalk traffic pick up and others settle into the tables around me, each with their plate of paella. It was a colorful and flavorful meal – just what I needed to take me through an afternoon of wandering around the city. And it seemed like such a fortuitous and pleasant discovery that it’s one memory I’m sure to have for years to come. 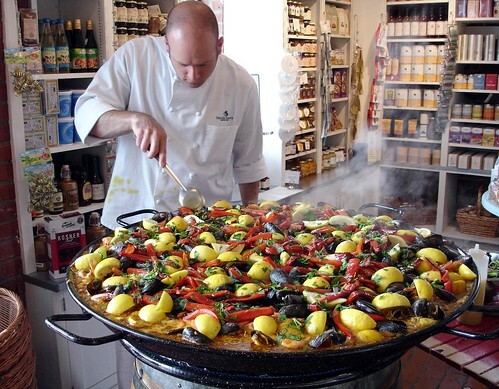 If you find yourself at Fisherman’s Wharf some Saturday morning, swing by Oakville Grocery for your own plate of Spanish Treasure!